Minister Pinder accompanied a large private sector delegation from The Bahamas of more than 30 representatives, who were in attendance to further the interests and profile of The Bahamas in the international marketplace. 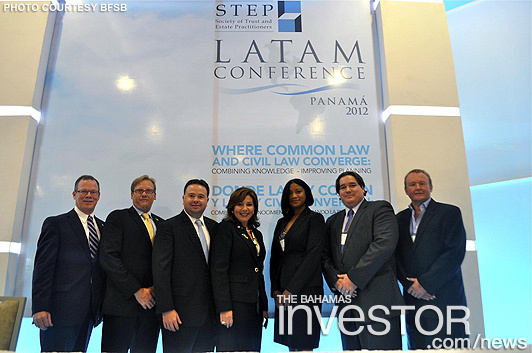 The panel included other representatives of international financial centres (IFCs), including London attorney Richard Hay, Cayman Island attorney Andrew Miller and Panamanian attorney and former Minister of the Panamanian Government, Adolfo Linares. The panel discussed how IFCs perform a role in the legitimate movement of investment capital within an environment of increasing global transparency, and how such increasing transparency impacts the use of IFCs for Latin American planning. Minister Pinder emphasized that many IFCs, and particularly The Bahamas, are well-regulated jurisdictions, compliant with international best practices. He explained that in an environment where the financial services industry is continually evolving, participants in this industry must be nimble and react to a changing environment. Minister Pinder explained that IFCs must not only facilitate international business, but also participate in international business. Using The Bahamas as an example of a policy of participation, it was explained how the portfolio responsibilities for The Bahamas’ Ministry of Financial Services not only included the development of the domestic financial services industry, but also included the development of trade and industry policy. Recognizing the observation of the panel moderator, Richard Hay, that IFCs assist trade and financial intermediation, facilitating globalization, Minister Pinder stated that by coupling a trade agenda and financial services, The Bahamas was leading the way in participating, and not merely facilitating, global economic development, and specifically international trade of goods and services. Through the development of an international trade agenda, new sectors of financial services develop, inclusive of commercial banking and international insurance, he said. The participation in international business and trade also supports the international reputation of countries such as The Bahamas as IFCs. Minister Pinder closed the panel discussion with the observation that governments of IFCs should be focused on anticipating the development of the international financial services industry and the evolution of international best practices. By staying ahead of the curve, not only are international financial services industries globally in a better position to survive, but to thrive and further develop, even in the face of international pressures.